We speak to prominent society members about their observances of the season, from the time-honed ones to the modern rituals, and what these practices mean to them. The Chinese New Year season is an anticipated holiday for many reasons – aside from the abundance of festive food and ang pow, reunions are occasions to observe time-tested family traditions and practices. 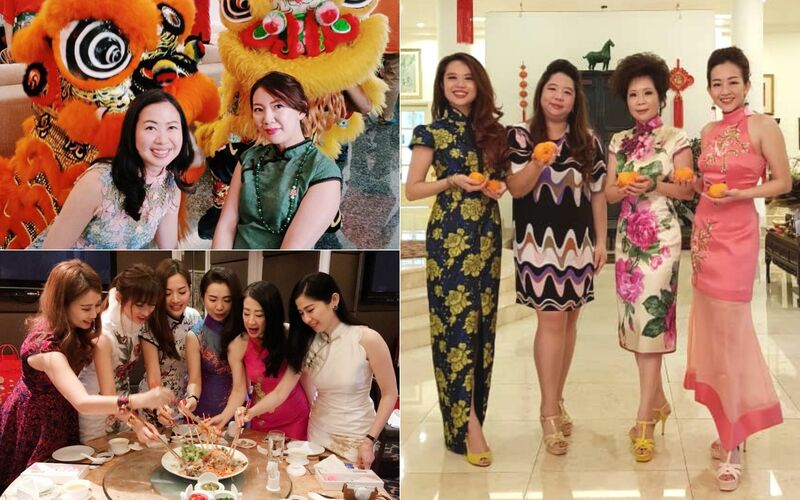 Our high society friends can attest to that: Chinese New Year celebrations are among their highlights of the year where cherished memories are made and passed on to the next generation. Malaysia Tatler finds out what their own family tradition are and why they are symbolic. Every year after our family reunion dinner, all the cousins get together and serve tea to the elders and ask for forgiveness for any wrongdoings. I have always loved these simple traditions as they represent a big part of our culture and foster stronger family relationships across generations. The rest of the evening is spent playing cards and board games, which can get intensely competitive! When I was single, reunion with my parents and the whole family on the eve of Chinese New Year is a must in Ipoh. When I got married, I observed the traditional way of having my reunion at my husband's side in Malacca. As a family it is important to stay bonded and connect with those living overseas who make the effort to come back. And giving ang pow to family members and even friends’ children is a blessed tradition. We give because we can afford to and it’s a wonderful feeling. The tradition starts on the eve over a family dinner, then we’ll stay awake until midnight, which we started 'practising' from childhood. As soon as the clock strikes 12 it feels like a war zone in Kuching – every house sets off a plethora of fire crackers and fire works! The significance of it is to ward off bad luck, and to shower one’s house entrance with a ‘red carpet’! On day 1 of the New Year, the carpet of red welcomes the lion dance and the good fortune they bring. We still practice the tradition of visiting each other’s homes. Friends and family would come over in their new clothing for food, drinks and merriment. What I love most about these traditions is how they are still being introduced to the next generation. At the end of the Chinese calendar year on the 30th night, prior to Chinese New Year, family members from far and wide gather at my parents’ house for our yearly prayers. It’s a tradition we’ve practiced ever since I was born. It's our time to give thanks for the year and reflect on the moments we had. We pray for what we aim to achieve in the coming year. Shen-Tel and I prayed for our kids and our wishes came true. It's important to keep these rare traditions, to keep them alive and carry forward. Our most important Chinese New Year celebration in Penang will be the bai tien gong or 'Pray to Deity' on the 8th day of Chinese New Year. This is a tradition that my mother-in-law holds dear as a Hokkien practice, and the whole family will make an effort to return for reunion. Food stuffs and praying material will be ordered and prepared way before Chinese New Year on an elaborate table set up, and prayers are done at 12 midnight. After the session we will have a huge bonfire at the entrance to burn all the offerings to the deities and pray for peace and prosperity. There will be a session of fire crackers – a kids’ favourite –before supper. Other households follow similar practices so the whole town will be rowdy till the wee hours. Everyone is on holiday. This to me is a real Chinese New Year. It has got to be lou hei or lou sang with my friends and family! The weeks before CNY my calendar will be filled with lou hei gatherings with close friends. It’s a ritual we never missed. A good time to catch up with friends and to wish each other good fortune for the coming year! My favourite Chinese New Year tradition takes place in the morning of the first day. We would wake up to the loud sounds of traditional Chinese songs and head downstairs in our house clothes to eat breakfast which consists of one sole dish- Chai, a vegetarian dish that we have only once a year. My children will bid us well wishes and serve tea upon which we would give them ang pao. Afterwards, we would all change into our brand new CNY outfits for the annual family photo taking which usually takes a while, especially now with my grandchildren running around. These morning traditions remain one of the most fun and memorable practices and have been in the family for as long as I can remember, and hopefully will remain for many years to come. We are having a lion dance performance and dinner with lou sang. My husband Tan Sri G Gnanalingam is Ceylonese but welcomes all traditions, be it Chinese, Hindu, Buddhist, with even a Christmas tree during the festive season. It is very ‘Malaysia Boleh’. Joanna Ling Although the executive director of PE Land Sdn Bhd oversees three shopping mall assets, she regularly enrols in educational courses to upskill herself.